That’s my story, and I’m sticking to it. I wasn’t remotely interested in the iPhone when it was announced, and only had lukewarm curiosity by the time it was released. However, it still roped me in eventually, and I’ve been locked in ever since. How about you? 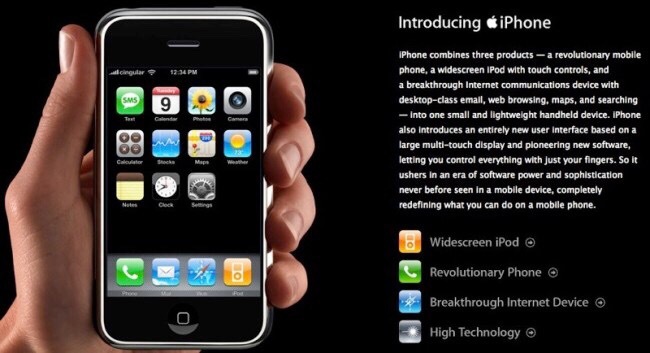 What did you think of the original iPhone when it was announced, and then when it was released? Were you all in right off the bat, or were you a skeptic like me? Were you in one of those original lines on launch day, or did it take a while for you to come around? For those of you who owned an original iPhone, what did you think of it after using it for a while? What do you think of it now, in hindsight? The release of the original iPhone WAS significant. It WAS revolutionary, not just in the world of technology, but also in the world at large. However, the real reason for that significance is you and I. Without the users who saw the iPhone as a radical departure from what had become a very mundane and unimaginative smartphone market, and saw past its initials flaws and shortcomings to what it could later become, the original iPhone may have been nothing more than a footnote. But that’s not what happened. Many of us bought into a vision that a multitude of Apple employees poured a large portion of themselves into, and here we are ten years later, looking back at a history that would have seemed impossible at the time. That history is worth remembering, and for me, the personal stories of users resonate just as loudly as those of Steve Jobs and the throngs of managers and developers at the Apple that played a role in bringing the iPhone an iOS to life. On that note, to look back at this ten year anniversary of the iPhone, why not tell me and the other readers here your iPhone story. You can share your thoughts here in the Commens below, on Flipboard, on our Facebook page, or on Twitter @iPadInsightBlog.